This week we took the drone for a spin a couple of times. We got permission from MGB and Army and flew around Dobass Arena for a bit, and down by the Kalmius River. Still getting the camera dialed in, but if flies like a bird. made a vid with Baikal, my old pal from XAH Bn. He was a Staff Officer when I was there, and one of my best friends. He lived 20 years in Luganskaya (not Lugansk) near Debaltsevo, until the nazis seized the town. He lost his home and 2 businesses, moved to Donetsk and joined the NAF. His story is interesting and heart-rending. 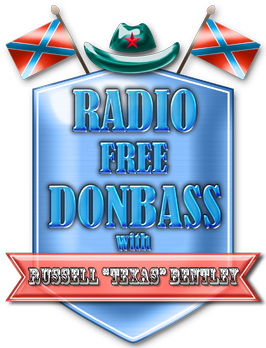 It will be published next week as the next Donbass With Texac vid. On Saturday, Father Boris and I, along with EoT film crew went to a kid's wrestling match in Kirovsky District, at a sports club we sponsor. Thanks to all who have pitched in for the kids - Donbass Human Aid, Spendaktionen fur Novorussia and all individual contributors. We will post a vid about the match and the club soon. Had a good evening with Abdullah and Alfonzo, two of the guys I was on the Russia 1 TV program "Special Correspondent" with. It was a HUGE show, estimated 50 million viewers. Thanks to Sahsa Sladkov and the Russia 1 crew for a really cool show! Speaking of taking time, I am still working on my book about my 6 months as a soldier at the Front in the Donbass War. I'm about halfway through, but everyday life keeps popping up and interfering. Writing a book is real work, but it's gonna be a good one - a real life adventure and a tale of redemption, with some pretty funny (and scary) moments thrown in. I am working off the journal I kept while I was at the Front. Re-reading it, I realize I had already forgotten just how hard and dangerous the time at the Front really was. Many of my friends died there, many more got wounded. It truly is a miracle I lived and made it out OK. Thanks, to all my Guardian Angels! I will try to be worthy of your care! So, today is a cold and rainy Sunday afternoon, perfect writing weather. Guess I'll get busy!